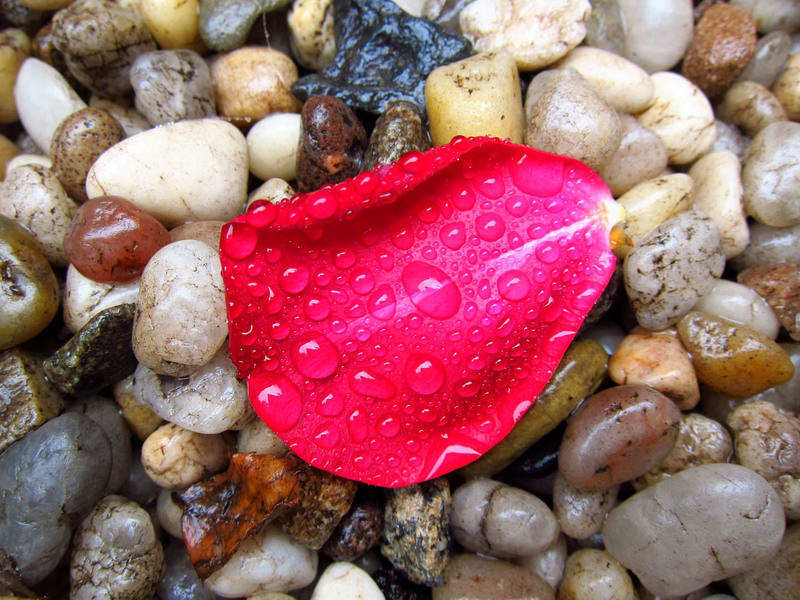 A single red rose petal lay on the gravel of the terrace this morning. It had blown over in last night's rain from the next door terrace where a red and a yellow climbing rose have been in late season bloom. by viewing your website. I always make viewing your site the last thing I do on computer, to keep with me its lingering perfume. How nice what anonymous has said, how could I add to it? Lovely image. Absolutely stunning photograph and love your gravel floor! Anonymous - I did not know about St Therese and roses...I am glad that whatever was wrong is coming right. And thank you. This picture, for some reason, speaks to me of the Pacific Northwest... Beautiful indeed! That's lovely and I enjoyed Anonymous' comment. I found you through elk's blog. It looks like you have 3 blogs, that's very ambitious. I have tried to start a 2nd blog, exclusively about my cats, but I find it very hard to keep up with 2 so my original one gets most of my attention. Fortunately, my many cats are not neglected :) Your cat blog is cute. Did Bloomberg start Occupy Wall Street?